SKORPIOS (Scorpius) was a giant scorpion sent by Gaia the Earth to slay the giant Orion when he threatened to slay all the beasts of the world. Orion and the Scorpion were afterwards placed amongst the stars as the constellations of the same name. The two opponents are never seen in the sky at the same time--for as one constellation rises, the other sets. 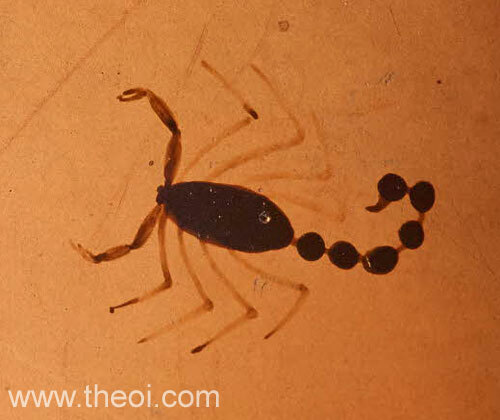 The ancient Greek Skorpios originally encompassed two constellations--Scorpio formed its body and Libra its claws. "Hesiod says that . . . Orion went away to Krete (Crete) and spent his time hunting in company with Artemis and Leto. It seems that he threatened to kill every beast there was on earth; whereupon, in her anger, Ge (Gaea, the Earth) sent up against him a Scorpion of very great size by which he was stung and so perished. After this Zeus, at the prayer of Artemis and Leto, put him among the stars, because of his manliness, and the Scorpion also as a memorial of him and of what had occurred." "The winding [constellation] River will straightway sink in fair flowing ocean at the coming of Scorpios [constellation Scorpio], whose rising puts to flight even the mighty Orion. Thy pardon, Artemis, we crave! There is a tale told by the men of old, who said that stout Orion laid hands upon her robe, what time in Khios (Chios) he was smiting with his strong club all manner of beasts, as a service of the hunt to that King Oinopion (Oenopion). But she forthwith rent in twain the surrounding hills of the island and roused up against him another kind of beast--even the Scorpion, who proving mightier wounded him, mighty though he was, and slew him, for that he had vexed Artemis. Wherefore, too, men say that at the rising of the Scorpion in the East Orion flees at the Western verge." "Scorpio. This sign is divided into two parts on account of the great spread of the claws. One part of it our writers have called the Balance (Libra). But the whole was put in the sky, its is said, for the following reason : Orion, since he used to hunt, and felt confident that he was most skilled of all in that pursuit, said even to Diana [Artemis] and Latona [Leto] that he was able to kill anything the earth produced. Tellus (Earth) [Gaia], angered at this, sent the Scorpion which is said to have killed him. Jove [Zeus], however, admiring the courage of both, put the Scorpion among the stars, as a lesson to men not to be too self-confident. Diana [Artemis], then, because of her affection for Orion, asked Jove to show to her request the same favour he had given of his own accord to Tellus [Gaia]. And so the constellation was established in such a way that when Scorpion rises, Orion sets." "Delia [Artemis] made him [Orion] her companion; he guarded the goddess and he served her. Imprudent words incite the anger of gods : ‘There is no beast,’ he said, ‘I cannot beat.’ Tellus (Earth) [Gaia] unleashed a scorpion. Its urge was to stab the goddess of twins with its hooked stingers. Orion blocked it. Latona [Leto] joined him to the bright stars, and said, ‘Receive your reward for service.’"
Aratus, Phaenomena - Greek Astronomy C3rd B.C. Other references not currently quoted here: Manilus 2. 32 & 2. 433.